Miss Ivy is enjoying the last warm days of Summer in the NC mountains. She likes to sun herself on the stones, and nibble on the pansies. She is very glad she lives in the South, where winters are usually milder. But she would be happy to see other parts of the world too, if you would like to show them to her. She is very adventurous. Ivy was crocheted with 100% acrylic yarn and stuffed with polyester fiberfill. 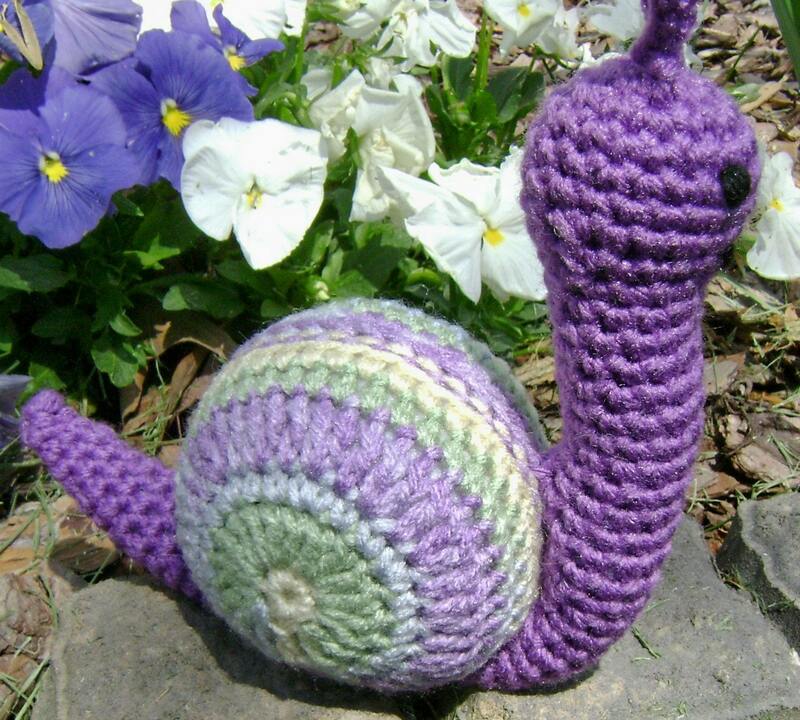 Her shell is made with a variegated yarn in shades of moss and sage green, ecru, smoky blue and orchid, which compliments her purple body very nicely. The placement of the colors on the shell vary slightly from snail to snail, so that each one is unique! Ivy's eyes were embroidered with black yarn. She is 7 ¾ (19.7 cm) inches tall to the top of her antenna, 7 ¾ inches (19.7 cm) long to the tip of her tail, and 2 ¼ (5.7 cm) inches wide. Ivy was designed and crocheted by me, in a smoke free, pet friendly home. Shipping: USPS first class mail, with delivery confirmation where available. Please see the Shipping & Policies tab for costs. Any duties or customs fees are the responsibility of the purchaser. I combine shipping to get you the best rate for multiple items purchased at the same time. Other custom colors are available if you would like to place an order. Just contact me.